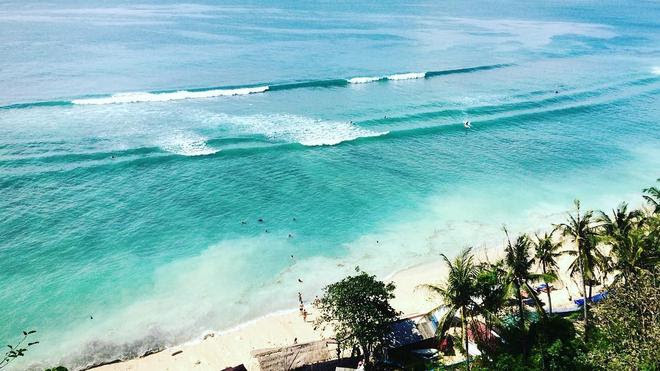 Last week in our Bali Beach series, we shared with you 6 of Bali's most popular sun and surf spots. 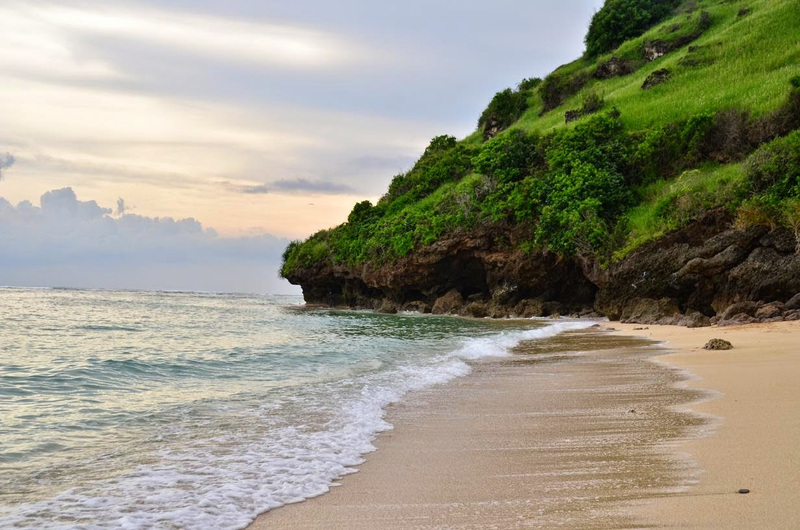 This week, we want to take you the quieter, lesser-known beaches that are hidden all over South Bali. These beaches are blessedly quiet and peaceful, with fewer crowds and sublime views that will keep you coming back for more. 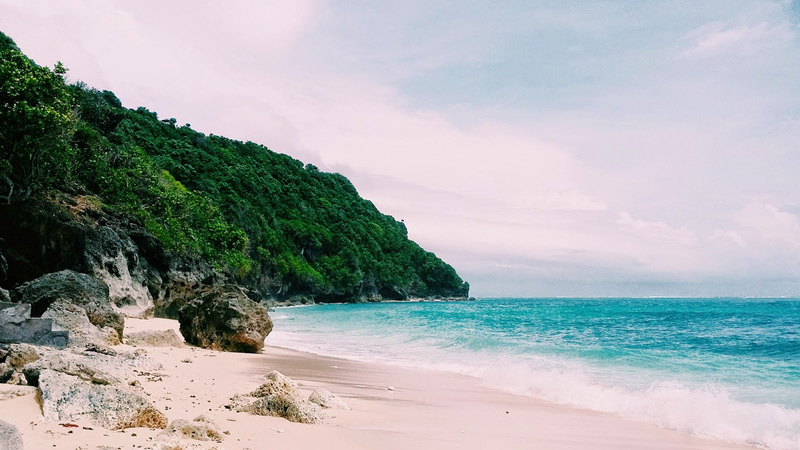 So if you're one of those adventurous types who are on a quest to discover Bali's hidden beaches, this article will be a great guide for you. Read more below! Also in this week's issue is 2 of Bali's most Instagrammable beach – scroll to the bottom to read. This beach is like an open secret; everyone knows about it but not many have actually been there. Located in Uluwatu near Padang-Padang Beach and named after the Thomas Homestay nearby, Thomas Beach is definitely a treasure and like all treasures, you'll have to work to get to it! Be prepared to climb down a hundred or so steps – but once you get to the beach below you'll see how it is all totally worth your while. We're talking about sparkling white sands, soaring cliffs, clear blue sea, and your own space away from the crowds! We love this particular hidden beach thanks to its incredible panorama and somewhat isolated location. From the parking lot, it is an easy stroll by the cliff's edge towards the beginning of hundreds of steps that will take you down to the beach. The views from the top are amazing to say the least; infinite blue as far as the eye can see, framed by the lush greenery of the surrounding hills. Located in Kutuh Village, the beach was named after the nearby Gunung Payung Temple. Once you get down to the beach, you'll find soft, powdery white sands and gentle clear waters underneath soaring cliffs and rock overhangs. The waters here are calm and perfect for swimming. Those in Canggu looking for a quiet spot away from all the crowds can head towards Cemagi Beach, also known as Mengening Beach. The drive to this beach is amazing, as you'll pass by acres of rice fields before reaching the beach at the very end of a small road. This is an exotic black sand beach that is located a dozen or so steps below, a beautiful strip of sparkling black nestled amidst tall rock formations and the sea. When you're there, you'll see there are some large rocks on the beach which leads out to the sea, and on it, a small temple called Gede Luhur Batungaus Temple. Some people have likened this temple to Tanah Lot, as it appears somewhat similar from a distance. Who would have thought that in between the world famous Berawa Beach and Echo Beach in Canggu, there is a small strip of quiet beachfront space that we can all enjoy in stillness and serenity. Pantai Perancak or Perancak Beach is named after Pura Perancak and it can be hard to miss. 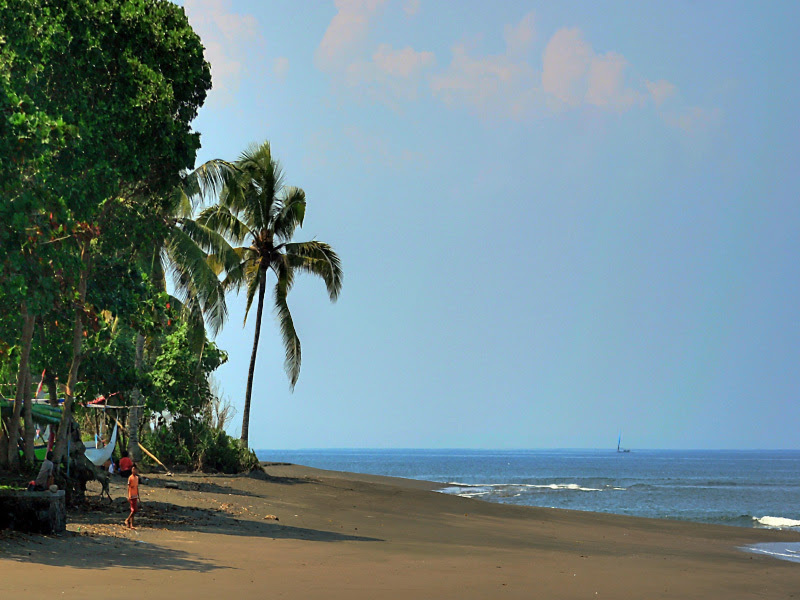 The entrance to the beach is located behind the temple, next to a large parking space and a Balinese wantilan. The beach used to be almost completely deserted, but of course with time, it has risen to popularity. Now you'll find some local vendors selling snacks here and children playing in the small stream that flows towards ocean. The beach is being managed by the local village, so it is clean and natural, the perfect space for a quiet sunset stroll or a walk with your furry four legged friend. Those looking for a day of complete peace and tranquillity can venture out to Green Bowl Beach, which is surprisingly near to the bustling Pandawa Beach in Ungasan. There is a small parking area at the entrance to the beach, a few small warung and toilets. Like all hidden beaches, you'll have to climb down hundreds of steps to get to the beach below – which you will immensely enjoy when you see its pristine beauty with your own eyes. There is also a small cave here on the beach which you can explore. The surf's a bit rough for swimming so do proceed with caution. 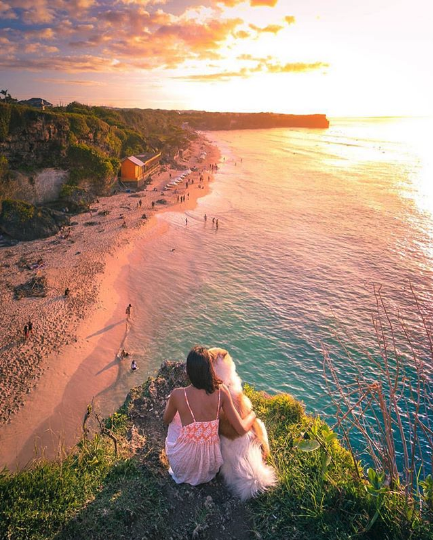 This popular Instagram spot overlooks Balangan Beach, a surfer and hippie haven nestled on a stretch of golden sand between limestone cliffs and one of Bali's most popular surf breaks. The beach has a unique tropical bohemian hipster vibe to it, thanks to the row of thatched wooden cottages that populate its sandy shores. These are restaurants and guesthouses, filled with surfers and beachgoers. The waters here are great for swimming but be careful of the sea's rocky bottom, you'll best wear water shoes to protect your feet. If you're not into surfing, a stroll along the coastline is a fantastic way to while your time, or just relax on a sunbed which are available for rent. We're sure that you've seen hundreds of photos of this beach on Instagram! Located on Bali's sister island of Nusa Penida, Kelingking Beach is named after the smallest finger, due to its unique shape. This is a definite must-visit especially for the adventurous. The view from above is unmatched, with a beautiful hidden beach below. 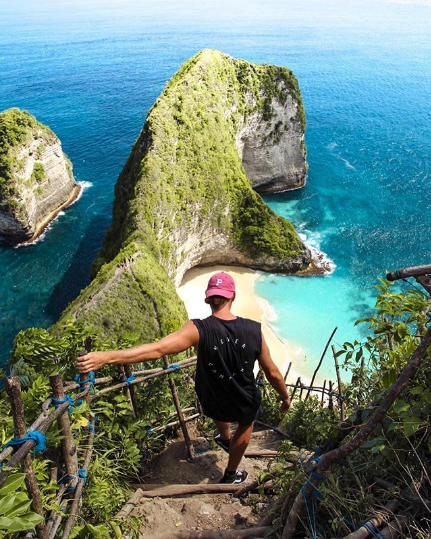 Nusa Penida is an explorer's dream – you'll need a few days to discover all of its natural beauty but you could also enjoy the island on a day-trip. Kelingking Beach is located 30 minutes by motorbike from the harbour. Be careful while heading there, the roads are set on the cliff's edge and there are no railings along most areas.